Personally, I truly admire Scher’s work and her more chaotic style of typography and imagery. As someone who also enjoys working with type, this project was particularly satisfying for me and it challenged me to make something pleasing to look at while still conveying the essential information. I can see my own personal style in the composition as well. 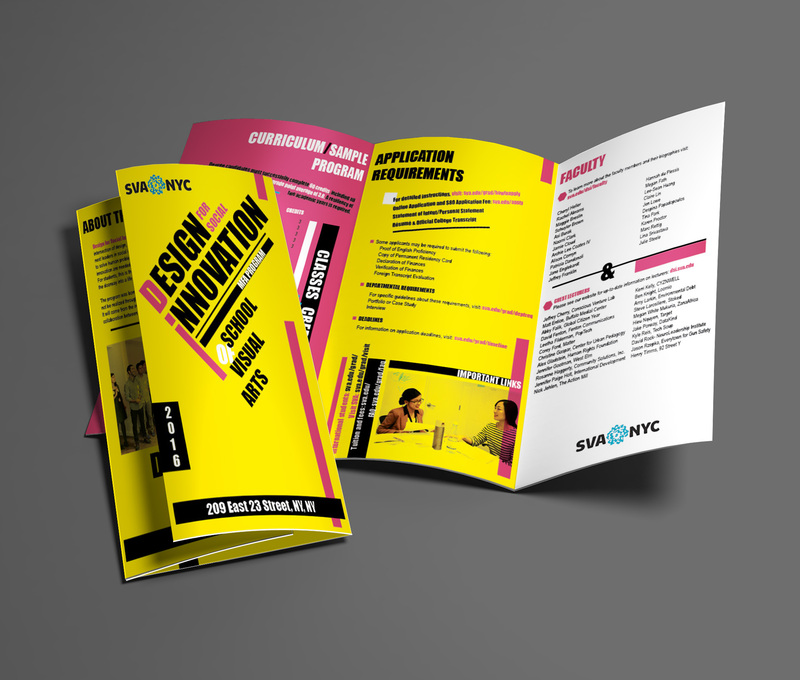 The object of the project was to design a brochure for the Design for Social Innovation graduate program at the SVA (School of Visual Arts) in the style of Paula Scher. We were given the instructions for what information we were inquired to include (all text and information was taken from the SVA website and brochure) and we had to design the brochure that presented the information in an innovative, creative way that would make readers want to read it. All parts of the brochure should be treated both as a unified whole and individual pages that should be visually interesting when presented alone. I mainly used bold/vibrant colors and typography (main typefaces were Impact and Arial Narrow) and incorporated colored bars and lines as other design elements. Because it was designed in the style of Paula Scher, the typography was more experimental, using more dynamic formatting and composition (not everything was straight and horizontal).